Business presentations are extremely important when it comes to advancing in your career. Perfecting your slideshow, proposal, and pitch is the first step to impressing your boss with the ideas you have to offer your company. Tiffany Pham, author of YOU ARE A MOGUL, shares the mistakes to avoid when pitching an idea, concept or product to management. Avoid These Mistakes When Pitching Page 125 Throughout your career, there may be times when you need to pitch an idea, or sell a new initiative internally, even if you are not an entrepreneur. The company for which you work may have asked you to develop a new product and pitch it internally to receive buy- in and funding from senior management, for example. As a result, I wanted to share with you some of the mistakes I’ve made in presenting, so you can be sure to avoid the same ones. Though I nowadays generally “pitch” over tea and conversation without the use of a pitch deck, in the early days of Mogul, I always used a pitch deck in order to visually convince someone to come on board, sharing slide by slide our mission and metrics. The background was black. Which looks great on a screen. But if the person you are sending your presentation to prints it out, it is hard to read, plus you owe them twenty-five dollars for new toner for their printer. Most likely, they won’t even want to print it out. So don’t make your presentation on black, no matter how powerful that may look on a screen. Because I was so data-focused from my HBS background, I put all the most impressive data on one slide, resulting in a very crowded and hard-to-read slide, instead of spreading it out and giving each data point space on its own. What I know now is that each slide should be making a point—hitting a home run on its own—otherwise, it’s not needed. In other words, if this slide was the only slide that someone saw, it alone should make him or her believe in what you are pitching. Not because it is filled with data, but because it packs a serious punch and makes a point all on its own. The logos I used were too small to really see. If you have a logo slide of partners or other investors or backers or clients, further establishing your validity, blow up those logos. In the end, every small “yes” you get will help you land a bigger “yes.” Therefore, collect and display those small “yeses” proudly; use them to create more momentum. Luckily, I didn’t know how bad my deck was when I went into my call with Will. Ignorance is bliss, right? But I quickly made sure to fix it before going to my next investor meeting. 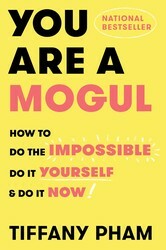 For more tips on how to succeed in life and to gain the confidence you need check out YOU ARE A MOGUL by Tiffany Pham! For more on networking and conducting business….